Bored of reading texts! Watch the video instead. Though computers work this fast, they still provide reliable outputs. Today's technology enables computers to execute billions of tasks in seconds. However, to get correct output, the input has to be correct too. Output from a computer is so reliable that if the output is unexpected then it is called, "Garbage in, Garbage out". Computers can perform floating point operation to so many decimal points that the accuracy is beyond expected. As computer is a machine, not a living being, it never gets tired. Simply, it can also keep repeating the same task as many times as it is asked too. While computer has storage to store user's data (mostly), it also comes with memory (both volatile and non-volatile) which is used by the computer itself to work fast. Memory devices are expensive than storage, thus though a computer, these days, can work with nearly 256 GB of memories, most computers come with 8 GB to 16 GB of RAM (volatile memory) or Primary Memory. Computer also includes ROM (non-volatile), and Cache memories of different levels and register memories. Among these, mostly the RAM is expandable. Computer can't think and take decision itself. But computer programs can be written in a way so that it takes logical decisions. Still, it is just the program written by humans, executed by the computer. 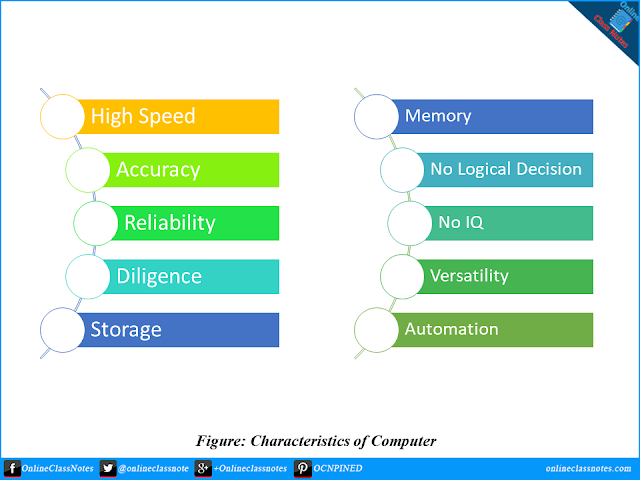 Computer is not only in use to calculate numeric values. Computer is in use in medical, scientific experiments, multimedia works etc. Computers cover mostly every area we can think of, now a days.